READY TO REGISTER YOUR CAMPER? Simply Click on the Penguin Below to Begin the Process. It’s not too late to get into the Camp all kids dream about! This last week we have these Iron Horse decorative sprocket added to gift box! If short on time, or a Grandparent is registering children, go straight to Payments to reserve your spot and come back to register. You can change your week later. Our Refund -Cancellation Policy is FULL REFUND with 30 days written notice before camp start date . Changing Camp Week – 30 days written notice, pending availability. WANT TO LEARN MORE ABOUT IRON HORSE COUNTRY ? We believe our camp builds children’s confidence and gives them a reason to live with passion. The reaction of parents to the changing attitudes of their children during a week of camp here is a constant reminder of what our camp gives to kids. Our Christmas Special has been our tradition to open up registration to the next year’s Summer Camp Season with lowered rates over the Thanksgiving/Black Friday and Christmas holiday season. It offers great pricing to help families get their children here next summer. And, we had a lot of fun planning for the items that get packed into the Christmas box ! 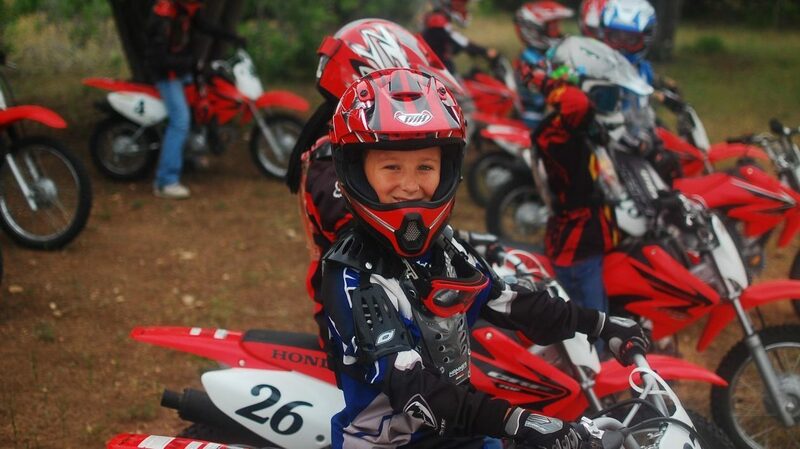 We know from our campers, your children will LOVE to wear Iron Horse swag to school, to show they are motocross kids. And to have one’s very own pair of motocross goggles to bring to camp next summer is just icing on the cake! Together we can help make childhood last just a little bit longer for your children and grandkids too!